We went back to St Ermin’s today to enjoy afternoon tea again and, in the process managed to avoid the hail that pelted London for a about 10 minutes. That was lucky! We could hear it from where we were seated in the Tea Lounge. We were in a corner furthest from the windows and doors but we could still hear the noise. I don’t know if I’ve ever written about it but I have this weird preoccupation about precipitation. I hear rain, I need to see it. I see snow coming down and I have to run to the nearest window to see the flakes floating down (yep, I’m very odd like that). But this afternoon, I was well-behaved and stayed in my seat. The afternoon tea was as lovely as I remembered. 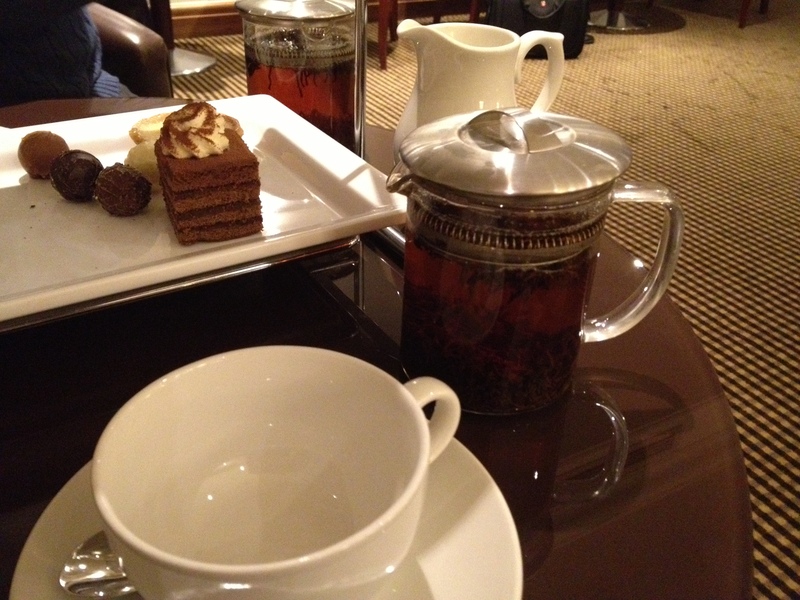 This was the second time we’d had afternoon tea in St Ermin’s so we knew that we could change the savoury and sweet elements of the afternoon tea. We chose our tea, asked for our favourites and waited. If you do want to enjoy afternoon tea in beautiful surroundings, without having to pay through the nose and having to adhere to strict dress codes (obviously common sense dictates that you do dress accordingly), try afternoon tea at St Ermin’s. The food is lovely, the teas are amazing, but most importantly, the staff are friendly and oh-s0-very-helpful! Anyway, after the lovely food and the even more delicious tea, my klutzy self chose to make an utterly flamboyant reappearance! As we were walking from the Tea Lounge to go and pay the St Ermin’s bees a visit (the hotel keeps bees and gives the honey produced in cute little pots to their guests), I managed to miss a step and fall on my left arm and smash my head on a wall with a loud bang. I’m sure it was caught on St Ermin’s CCTV, so at least my embarrassment would only be witnessed by whoever was manning the security cameras and there wasn’t anyone else except Alan to witness my epic fall from grace! I say epic because it felt like the worst expression of klutziness in my personal history, ever. Everything felt like it was happening in slow motion but at the same time it felt like it was over in a flash and I was left to enjoy the starts after my head hit the wall. Even Alan said he thought it happened so slowly that he thought I would be able to stop my head from hitting the wall. Evidently, I didn’t because, even to me, the sound of my head making contact with the wall was very loud. I am only thankful that it wasn’t a concrete wall or it had some sort of wooden panelling. Otherwise, I wouldn’t be sitting at home with only a sore head and bruised arms and a dreadfully damaged ego. I am so thankful for small mercies! On the way home, because it was Chinese New Year, I read my Chinese horoscope (I’m not necessarily superstitions but I do find it entertaining reading) and it says, that health-wise, for Dragons “Due to the existence of the inauspicious star Tiane (天厄), you will hardly maintain the stable health in 2017. To be simple, you may easily have minor illness or disaster, and suffer lingering cold or fever…” – lingering cold, check; minor disaster, fall and bang on the head today, check! I’ve never had my horoscope, Chinese or otherwise, be this spookily accurate! My head is still sore, and the left side of my body feels bruised. I can’t seem to straighten my left arm but I think this is because my arm took the brunt of the impact of my fall. I’ve had people say that I need to get checked out by a medical professional just to make sure I’m okay. I will…if anything completely out of the ordinary happens. But I am just mostly bruised so I don’t think I need to see a doctor…but I am keeping an open mind and am listening to my body. Be careful everyone! Watch where you step! It was horribly busy at work today and tomorrow is going to be an even longer day. It’s Budget Day tomorrow and the firm I work for has a post budget presentation for its clients. Tomorrow will be a long day because we’ll be prepping materials for the presentations. Ah well! I’m in my happy place though because I’m still thinking about last Tuesday when I had afternoon tea at The Cavendish. I’d never been to The Cavendish but it was easy enough to get to because it was right behind Fortnum and Mason. The hotel was understated but it was quietly elegant. We gave our names at bar concierge and I felt fairly special as we were made to feel like they were expecting us. We were led to a quite corner of the Lounge Bar and were given menus so we could choose our teas. 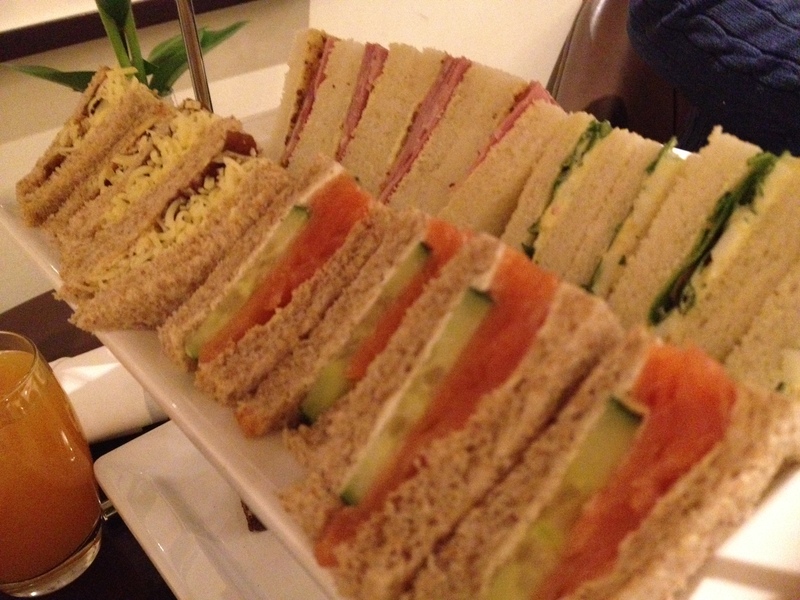 Afternoon Tea at The Cavendish is from 2 to 5PM everyday and they charge £18 per person. This includes a pot of tea for each person, a selection of finger sandwiches: Wicks Manor smoked ham with whole grain mustard, egg mayonnaise with rocket salad, Scottish smoked salmon with cucumber and cream cheese, and cheddar cheese and pickle; a selection of pastries, tartlets and chocolate truffles and scones with jam and clotted cream. 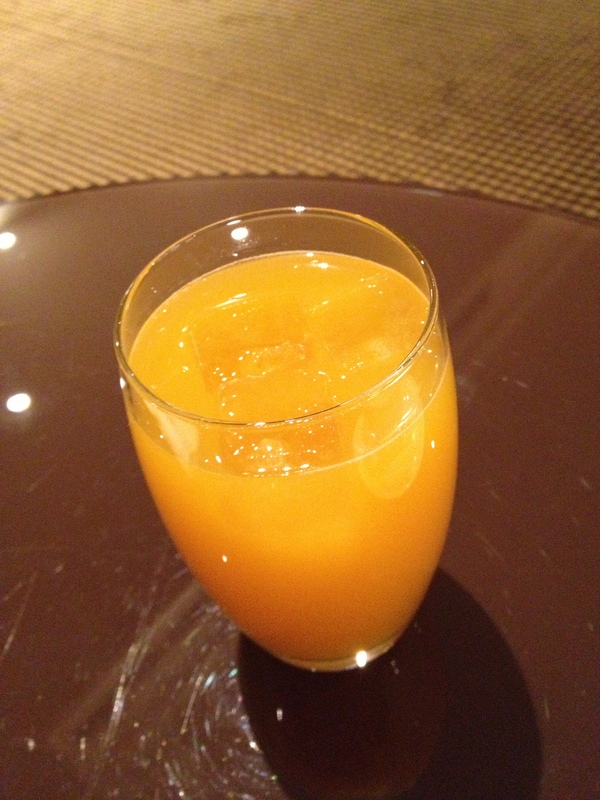 The £18 also includes a glass of champagne but I opted for the non-alcoholic option of passion fruit juice. On the menu it looked like a substantial amount of food but I wasn’t prepared for the amount of food that was brought to the table. It was a LOT! We ordered afternoon tea for two people but the food that was brought to the table could have easily fed four people very generously. I loved the service because the staff were wonderfully friendly and attentive. We were looked after well. I appreciated the fact that they offered to refill our teapots with hot water. The teapots held about two cups worth of tea and water costs next to nothing, but not ever establishment will offer to refill your teapot. I loved that about the Cavendish. While it is expected for most establishments to offer a non-alcoholic option, not every place does. We were given a lot of options to replace our glasses of champagne and I must say, the passion fruit juice that I had was wonderfully fresh! When the afternoon tea tray was brought to the table, it was brought to us with a slight flourish and the waiter explained the contents of each plate. 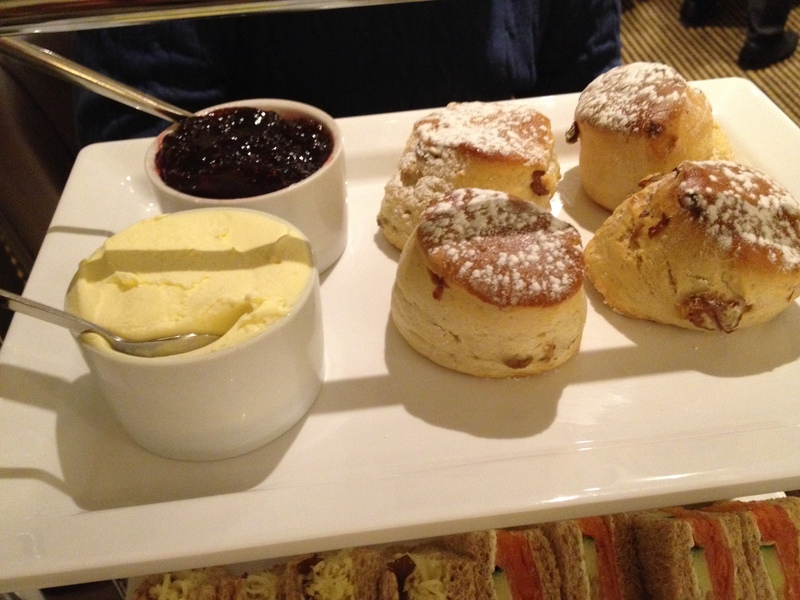 There were 2 scones for each person with large pots filled with delicious clotted cream and lovely jam. There were more than enough sandwiches which were generously filled. I love smoked salmon and the sandwiches were stuffed to bursting! You certainly get what you pay for and more! Am now looking at my calendar and planning my next visit! 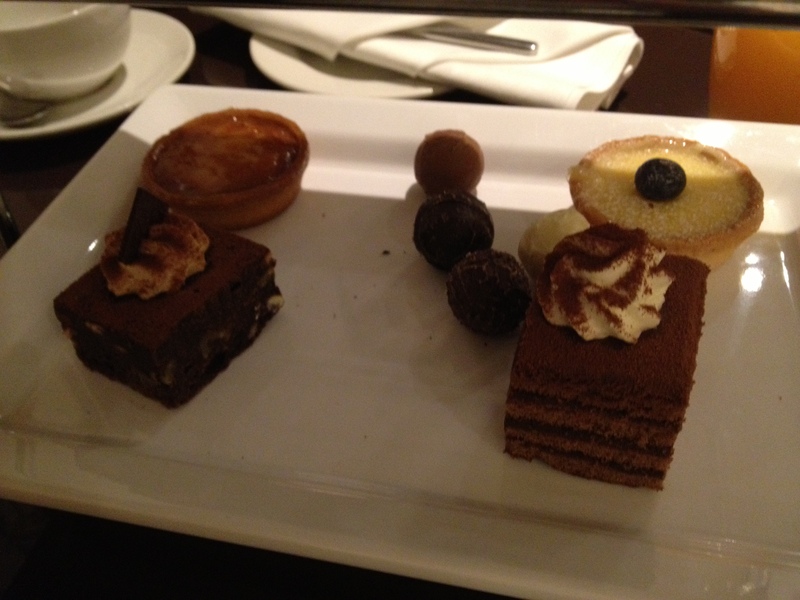 The sweet element was the mini cakes, tartlets and chocolate truffles and they were lovely! They were cute, individual pieces and very beautifully made. At one point during the meal, I certainly worried about not being able to finish the food (we couldn’t manage it in the end) because there was so much of it. I would definitely recommend having afternoon tea at The Cavendish. The venue is quiet and has the element of privacy even though the space is quite open plan. You get wonderfully attentive service from the staff and the food is definitely value for money. I’m certainly looking forward to the next visit!